It’s that time again! San Diego Comic Con! This year I’ll be going the entire weekend and can’t wait to introduce my girlfriend to the experience. I think she’ll dig it…at first. Then the lines, rude people and smells will become overwhelming. But hey, that’s just Comic Con. I love it! 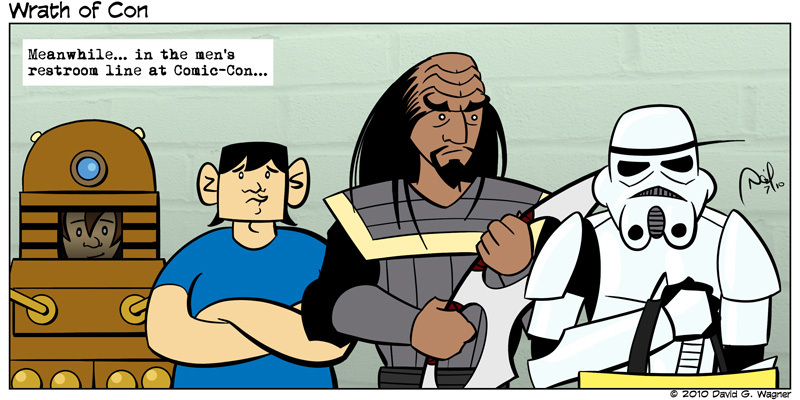 On a side note I realized that until now I had NEVER drawn a Klingon or Stormtrooper before (or Dalek for that matter). Oh and if you’re visiting this page because I met you at Comic Con, thanks for checking it out! Feel free to drop me a Tweet @dotproblems!